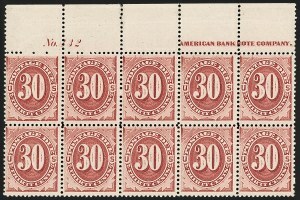 Since we started keeping computerized records, we have offered only two other Mint N.H. plate blocks of this issue--one top and one bottom. According to George Arfken's book on Postage Due stamps, in 1891 the American Bank Note Co. switched to a new kind of ink, which included aniline dye. The color is significantly brighter than the older Postage Due issues, and, unlike the older issues, it fluoresces under ultraviolet light. When questioned at the time, the Third Assistant Postmaster General Haven responded in a letter "the changes... are due partly to inappreciable differences in the fibre of the paper... and to mistakes in the mixing of the ink preparatory to printing." The high denomination Postage Dues were not used very often. When American Bank Note Co. turned over plates, transfer rolls and stamps on hand to the Bureau of Engraving and Printing (BEP) in 1893, there was an ample supply of stamps. 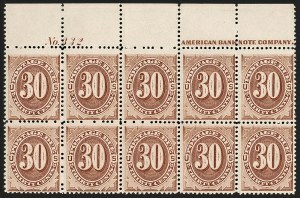 The BEP did not release their own 30¢ Postage Due stamps until 1895, after trying to exhaust the existing supply of American Bank Note Co. stamps. 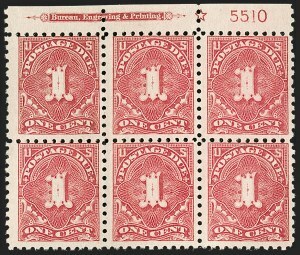 It is not known how many were printed in the new Bright Claret color, but it seems reasonable to assume that quantities were extremely limited. Our exhaustive search of auction records and The Philatelic Foundation failed to find another plate block. 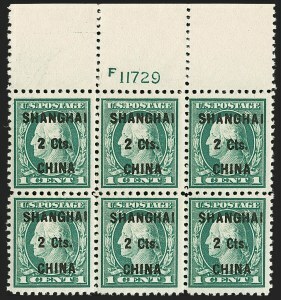 The Todd collection, which was probably the most comprehensive plate block collection ever formed, contained a top imprint and plate number strip of six. The Philatelic Foundation has only certified a bottom imprint and plate number strip of six. Scott J59 was issued concurrently with its regular issue counterparts, Scott 462-478. These issues were printed on unwatermarked paper. 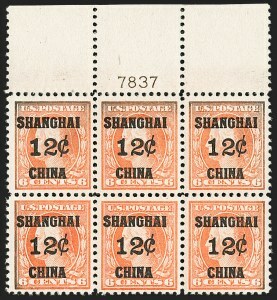 Similar to Scott 476A, a small supply of 1¢ and 2¢ Postage Due stamps were also printed on the unwatermarked paper. Perforations were soon changed from gauge 10 to 11, so only a small quantity was printed. It is generally found with poor centering.